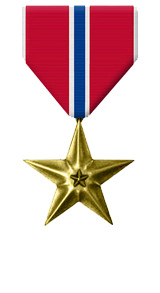 For meritorious achievement in connection with combat operations as the Battalion Operations Officer, 3d Battalion, 3d Marines, Combined Joint Task Force-76, from 1 July 2004 to 5 June 2005 in support of OPERATION ENDURING FREEDOM. Major Priddy performed his duties in an exemplary and highly professional manner. He wrote a comprehensive plan that ensured his unit was prepared in all individual and collective mission essential tasks required for counter-insurgency operations in Afghanistan. His guidance during the pre-deployment phase facilitated the rapid deployment and subsequent employment of the Battalion in support of combat operations. He authored plans that enabled the, Battalion to flawlessly execute three Battalion size, relief-in-place operations, and exercise a span of control over 6 Afghan provinces. Major Priddy’s keen insight led to the development of a concept of operations that disrupted and denied Taliban and Al Qaeda forces the ability to sustain support throughout the Battalion’s Area of Operation, particularly in the enemy strong hold of northern Kunar province. His mastery of planning, coordinating, and executing multiple combat operations simultaneously over a distributed battlefield, was key to mission accomplishment. His efforts helped provide an umbrella of security for the Afghan population that facilitated plans for local engagement, reconstruction, and successful parliamentary elections. Major Priddy’s total effectiveness, forceful leadership and loyal devotion to duty reflected great credit upon himself and upheld the highest traditions of the Marine Corps and the United States Naval Service.